This past weekend was pretty warm here, and by warm, I mean, it’s still January, and the temperature is above freezing. The snow is melting, and the magnolia next door is thinking about budding. But it’s still winter, and we can get hit by frigid temps and snowy weather any day, at least until April. So even though I’m already looking forward to Easter and spring and sunshine, there is still a need to stay warm. 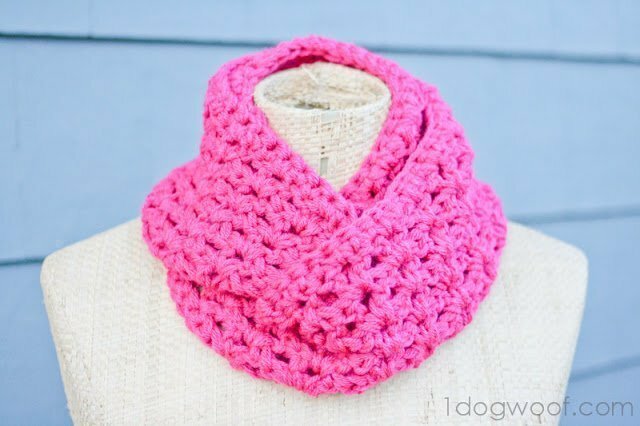 Here’s a smaller sized infinity scarf (or cowl) that’s light yet cozy and will keep you warm and brighten your days until spring! This was worked using a classic V-stitch, crocheted in the round. For added bulk, use 2 strands of yarn held together. Update: I made some minor corrections after some questions came up. There’s a round of sc before the V-stitches start. Then the number of V-stitch rounds is optional. I used 6, but you can work up as many or as little as you want. 2 balls of worsted weight yarn. 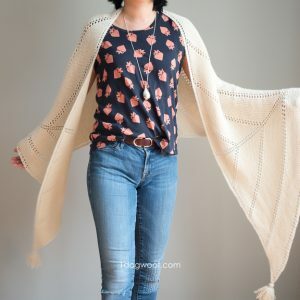 If you liked this pattern, or are new here, or both, and want more projects, take a moment and check out my other patterns! Good Morning ChiWei, I can crochet, but it has been a long time since I have made anything, so I think this cowl type scarf would be perfect. I am going to give it a go, I will let you know how I get on. Oooh, have fun! I’d love to see yours when you are done! It’s gorgeous, ChiWei – I LOVE these cowls. It saves me from having to figure out the most stylish way to wrap my scarf, LOL! We have full-on winter here this morning, the first “real” snow of the winter, so this would have been cute and handy this morning!! Blech! This is beautiful – and what a great color to perk up the winter wardrobe! I have never learned to crochet but might need to try my hand at it. Happy Monday! Thank you Kirsten! I’ll be having a crochet-along in a few weeks, if you’d care to join and learn with us. Have a great week! I decided yesterday I was going to make myself an infinity scarf, cuz I’m tired of the added bulkyness of a normal scarf under my coat. So your pattern comes in at the right time. I think this smaller one will be better than the full infinity scarf you have, but which do you prefer? Now to get some yarn! I love the look of V-stitch, and find it a relaxing crochet! Your cowl looks lovely! It’s beautiful! Wish I knew how to crochet. Love it!! So pretty!!! Love the color! Thanks so much for sharing. Wonderful! I’d love to have you come share some of your projects at my link party that just went live! I love it! I have pinned the pattern to make next on my list! Thank you! Love the color! You are so talented :). This is another reason, I need to learn to crochet! Love it!! So pretty! I love the bright pink you used, breaks up the gray of winter! This pink color is so cool, spice up a regular winter outfit! I love your pattern! I LOVE it! I’m hosting a CAL right now using the Calm Cowl pattern by Suzana Davidovic so I was especially interested in your cowl. I love that it is made using a bulky yarn. This is so cute! Thanks for sharing the pattern. Love the shade of pink you used here ChiWei! So pretty! Thanks for sharing! Very cute! I love the fun color. Cute! I love that color of pink! What a beautiful scarf, the color just jumps off the page! Very pretty scarf. I have a link party called Wednesdays Adorned From Above Blog Hop and would love to have you share this and any other posts with everyone. It runs from Tuesday night through midnight Sunday. Here is the link to the party. Found your pattern via petalsandpicots….thanks for this pattern! 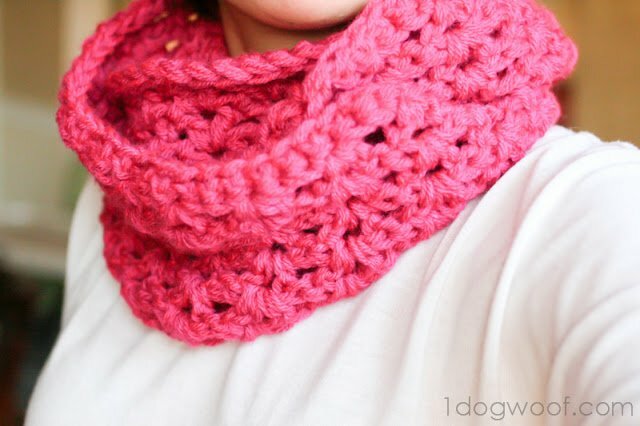 Been looking for a crochet infinity cowl (most ive found are knitted). Going to give it a try this weekend. You have a lovely blog :). This seems like the perfect project right now! Pinned this for future reference. Thanks for linking up at Hookin on Hump Day! Hi Kathy! You can post pictures on a blog, or Flickr or a Picasa website or Instagram or Pinterest, anywhere that can be publicly accessible, so when you share it at the link party, everyone else can see what you made. I am on row 2. Wondering what stich to do v stitch in. Chain space or dc? Thanks Heather – actually, I reviewed the pattern and missed one round of sc. And the V stitch is in the chain space. Thanks for the great catch! Beautiful. I have to learn to crochet. I am almost done with mine, and would love to make some fingerless gloves or hat (or both) with the same yarn. Do you have any ideas or patterns that you think are good? I’ve also added the Slinky Crochet flower to it as well and it’s turned out awesome! Great. Looks like just what I was thinking of!! Thanks!! Once you join into back ridge of chain should you be sc in the front or back of the chain. 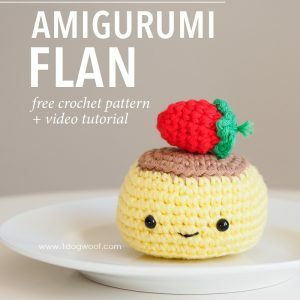 Sorry new to crochet and I’d like to get this right. I crochet in the front of the chain. 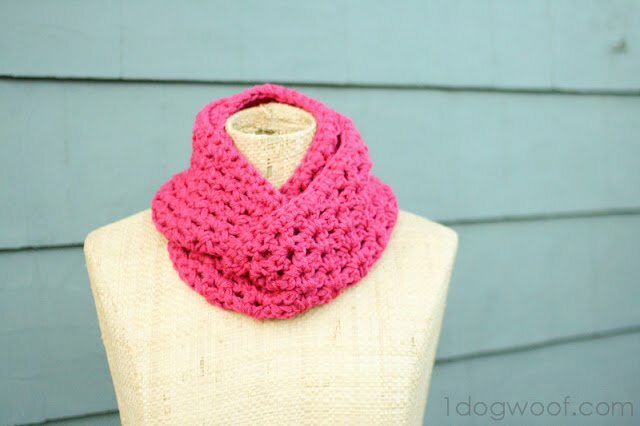 It gives it a slight twist but I think that’s what makes this cowl so perfect. “sc” is single crochet. Hope that helps! I like this! Got you from Sewing Barefoot’s link at Diana’s pin me link party. Pinned this, too! This is beautiful. I really should make me one too. I was wondering if this could be worked up with an N hook instead of M. For some odd reason, I have everything but an M and I’m too lazy to go buy one unless I really need to. Or could this be worked up with just one strand of yarn using like an H or J? Sure, you can use any size hook really – you just have to adjust yarn and gauge. The difference between an M and an N isn’t big enough to noticeably change the outcome. Working with 1 strand of yarn may make the scarf too small to be cozy, but it’s definitely doable! I am wondering if each row of vstitch goes into the middle of th v stitch in the previous row? Or does it go into horne top of a dc? I must have been half asleep last night! The answer is in round three! Sorry! I’m just getting into crochet and think this looks like a good first “real” project for me. You say two balls of worsted weight yarn. Can you expand on that with yardage or weight? I’m finding the amount of yarn needed for things to be the biggest mystery for me so far! Many thanks in advance! I loved the way mine came out using this pattern was seriously quick easy and soo cute! Thank you! Keep em comin! Hi Molly, That happens to me a lot too. I force myself to make the foundation chain really loose. Sometimes, I use a larger hook to make the chain, and then switch to the correct hook for the rest of the piece. I also rip out the first couple of rows, a lot, once I realize I made my chain too tightly, so yup, you’re not alone there! I’ve been told I should do videos, but to be super honest, I don’t like the sound of my voice, lol. So I’ve always shied away from video. If I do venture into the deep water that is video, I will definitely share it! I am almost finished with the cowl – coming out great! (present for my sister) Mine is definitley not as long as in the picture. Is it because this is the smaller size? Or is it because I am using a K hook or crocheting too tightly? Needing some help. I chain the 99. Make the sc row which is ch 1 and 99sc. Join to the ch1 and make a double crochet in that same join. Skip two sts…..then when I could to the end of that row I have 3 sc left before the join to start on the next row when there so be two sc. Any idea what I might be doing right? * I do chain the 3 then make a double crochet in the same st. That’s all worked in the join. If you have 3 stitches left, then maybe not crochet in the same stitch when you begin the round? I’m sorry I can’t help more. Hi, I have just started your end of Winter Infinity scarf and I love the pattern. I have just started Round 3 and I am unsure whether I do the V stitch where it says “dc ch1 dc into the ch 1 space” which is the bigger space made from previous round where I skipped 2 stitches or the smaller space just under the ch 1 as they are both located close together. I have been doing the V stitch into the bigger space lower down – is this right? Please reply before I go any further. Thank you for sharing this pattern, I have made this scarf longer and I have 163 stitches and made it using a light grey bulky Bernat yarn and size 9 hook. Thanks again! Great post. I wass checking constantly this weblog and I am inspired! Extremely helpful info specially the remaining part 🙂 I deal with such nfo much. I was looking for thhis particular information for a verfy lengthy time.